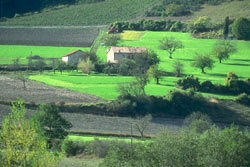 The Creuse is France's hidden department. You have to leave the beaten track to find the many interesting and attractive towns and hamlets dotted around the area. The most notable attraction is the plateau Millevaches ('a thousand springs') where you'll find the region's distinctive red cows grazing. In July and August you can take a steam train around the area. The traditional way of life hasn't died out in this part of France. If you stroll the countryside you'll see farmers with pitchforks and rakes rather than tractors. The countryside is at its prettiest in August when purple heather engulfs the landscape. Guéret is the departmental capital and is home to just 15,000 people. It is probably one of the most underrated towns in France. Its proximity to both the River Creuse and Lac du Courtille means that there are plenty of watersports available. The small town of Bourganeuf has less than 3,500 inhabitants. However, the town has a very affluent history. For a number of centuries the Knights Templars had their headquarters here but today, it is best known for its highly desirable carpeting. In fact, the floor of the foyer in the Empire State building is covered by material from Bourganeuf. La Souterraine ('the underground') is another small town with a population of just 5,000 people. It sits attractively between green hills with the River Creuse not that far away. The town is steeped in history and has drawn a lot of interest from archaeologists. The name, La Souterraine, refers to the town's 13th century crypt. Evaux les Bains is a spa town with a reputation for curing illnesses. If you're feeling a little strapped for cash while you're here then you could always grab a pan and wade into the nearby river with other gold hunters. Boussac and its surrounding villages are home to just 6,000 people, yet there is plenty on offer. The area is ideal for nature lovers as it is situated between three diverse landscapes - the vast plains of Berry to the north, the hilly landscape of Auvergne to the east and wooded areas to the south. There is a castle in the town with panoramic views over the surrounding countryside. 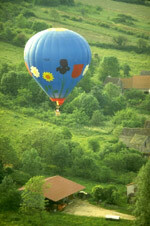 The easiest route to the Creuse from the UK is to fly into Limoges. Alternatively, the fast and efficient TGV train service will take you directly to the area from Paris. Property prices are still amongst the cheapest in the whole of France. The low-crime rate is also worth noting as it means home and car insurance are lower than elsewhere in the country. There are a number of bargains to be found, including many properties in need of a little renovation. Do you know Creuse better than we do? Do you have photos of Creuse? The Creuse is the north-eastern department of the Limousin region of central France.